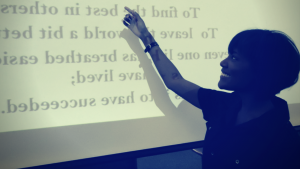 Presentations are a valuable learning activity – giving students the opportunity to practice speech and communication skills, to collaborate with others, and to develop digital, design, or storytelling literacies. However, when attempting to cycle through many individual or group presentations in limited class time, there can often be unneccesary stress and frustration as students take precious minutes with the need to login-in and out of various web services, search for and download files they’ve emailed to themselves, or even realize that they’ve left their flash drive at home and can’t access their files at all. If this sounds familiar, you may find this toolkit on Managing Student Digital Files in the Classroom handy. Toolkits are a great resource for faculty courtesy of the Teaching and Learning Collaborative and available on the Teaching and Learning website. The Toolkit on managing files offers tips on using several tech tools available to any UP faculty that can be used to collect and manage student files easily. You can save precious time in the classroom and model preparedness and digital savviness for your students at the same time. If you find this Toolkit useful, make sure to explore the Teaching and Learning website for more handy resources, and subscribe to the Teaching and Learning Blog for ongoing support, tips and suggestions from your fellow faculty and those who support instruction at UP. 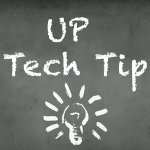 Today’s UP Tech Tip goes over how to create a handout of Powerpoint slides. You can create one and print it out or share digital to allow your audience to keep a copy and take notes on your presentation or lesson. This example uses PowerPoint 2016 on a Mac but the process is very similar on a PC.